The Israeli-Palestinian peace plan being prepared by US President Donald Trump is “a waste of time,” extremist Israeli Justice Minister Ayelet Shaked said, on Wednesday. Speaking before hundreds of ambassadors and attachés, at the Jerusalem Post Diplomats’ Conference, in Jerusalem, Shaked added that the differences between Israelis and Palestinians are too great. 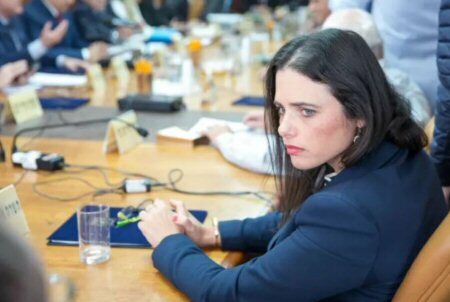 Days of Palestine further reports that Shaked also spoke about the demand made by her party, the Jewish Home, to appoint party leader Naftali Bennett as defence minister – an ultimatum that threatens the stability of Israeli Prime Minister Benjamin Netanyahu’s government. Earlier at the conference, Strategic Affair minister Gilad Erdan said that Israel is “closer than ever” to controlling parts, or all, of Gaza.